It’s that time of the year again in New England. The time of blizzards and winter storm warnings and constantly checking the local weather forecasts. But, we’re used to it, right? We’ve been through it a thousand times. Six to fifteen inches of snow is a walk in the park! But do you ever stop and think about all of that snow — and weight — accumulating on your roof? If you have a flat roof or only a slight pitch, the worry has probably crossed your mind. And with good reason! 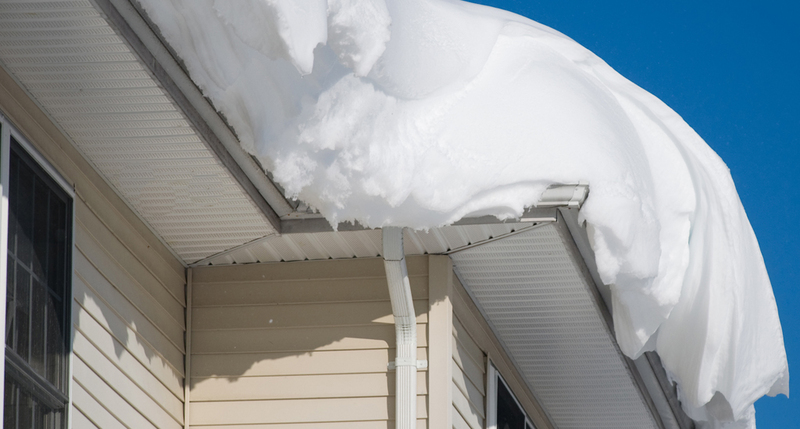 Removing snow from your roof can help prevent structural damage and ice dams. 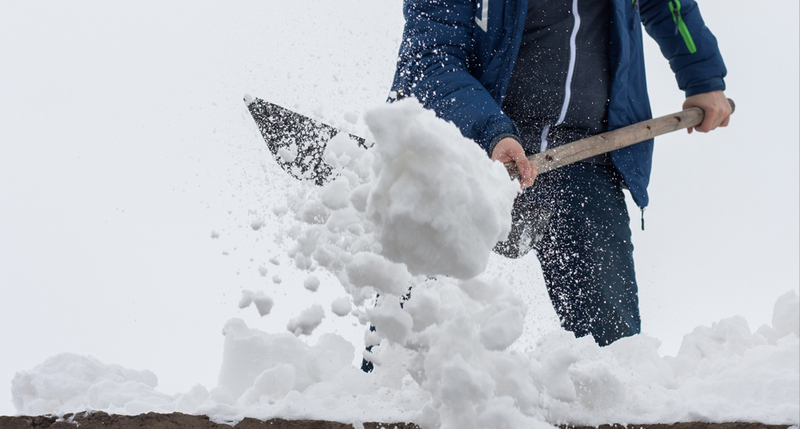 Whether you decide to hire a professional roof snow removal service or tackle the project yourself, safety is crucial (especially with rooftop snow removal). So let’s dive in and talk about how to safely remove snow from your roof, shall we? When should you take snow off your roof? First, let’s cover when it’s appropriate to remove snow from your roof. No reason to get worried over nothing, right? But it’s also important to know the signs of too much snow load and ice dams that could damage (or even collapse) your roof. The pitch of your roof — is it shallow or flat? Flat roofs and shallow pitches have a greater risk for structural damages and roof collapse. Why? Because the snow sits in the same spot and keeps accumulating. With flat roofs, even when the snow melts, the water stays put and could freeze (adding more weight). Is the snow wet and heavy? Is new snow accumulating on old (or frozen) snow? Snow density plays a bigger role than you might think. Wet and heavy snow weighs significantly more than snowfall that is light, fluffy or powdery. Snow rarely sits evenly on your roof. Many times, winds will push the snow into certain areas. For instance, areas where the pitch meets an exterior wall or valley where two slopes meet. An easy way to check for excess weight and stress on your roof is to open your windows and doors. That’s right — go through your home and test each one. Are they suddenly difficult to open or close? Do they feel jammed or stuck between the frame? That may be a clear warning sign of snow putting a strain on your roof structure. How many inches of snow will collapse a roof? Here’s the good news: many roofs are built to withstand normal amounts of snowfall, usually in the ballpark of three feet (which may be pushing it). That said, you have to consider the structural integrity of your roof, it’s design and other factors. Now let’s break down how much snow your roof can handle using a loose model of criteria. How old is your roof? Have you had it inspected or re-done within the past ten years? Is your roof flat or shallow pitched? How many inches of snow (within eyesight) has accumulated already? Are there any visible ice dams formed on your roof? Removing snow from your roof is a wise decision if your roof is flat or has a shallow pitch. As we mentioned above, these designs have a greater risk of structural damage and collapse. O.K., if you’re still reading, you’re probably considering removing snow from your roof. Either by hiring a professional snow removal service (that’s us!) or going the DIY route. 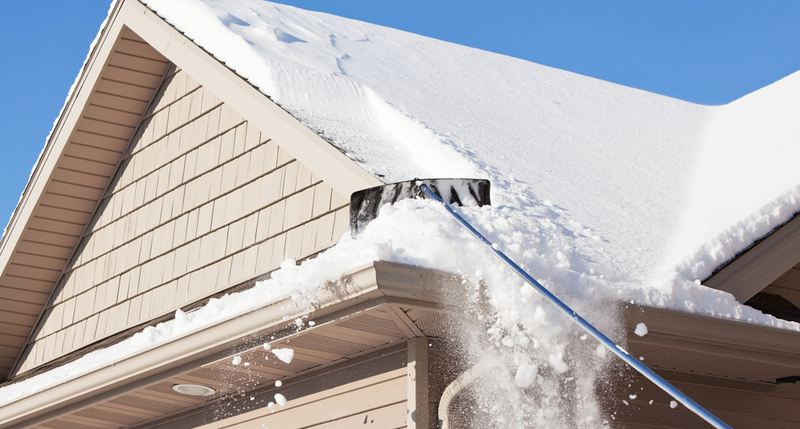 What’s most important is that you understand how to safely remove snow from your roof. Believe it or not, there are many cases of homeowners getting injured by climbing up on their snow-covered roofs every year. We don’t want that to happen to you! So here’s a quick list of “do’s and don’ts” to make your decision easier and safer. Start from the edge of your roof when you are attempting to remove snow yourself and work your way onto the roof from there. Keep in mind that metal tools used during the removal process may cause more damage to your roof and/or have the potential to conduct electricity if the tool comes in contact with a power line. Use plastic roof snow removal tools, such as a snow rake for pitched roofs. Try to keep a buildup of snow away from fire escapes, emergency building exits, drain downspouts, and ventilation openings. Contact a roofing professional to safely remove the buildup of snow if you are worried about the safety of your home or your roof. Don’t attempt to remove heavy layers of snow or ice yourself if you are not fully confident in your ability to do so. Removing snow from your rooftop can be dangerous, particularly if the snow has hardened into ice. Don’t attempt to melt the snow/ice on your roof yourself through the use of open-flame devices or electronic devices such as hair-dryers or heat guns. This will only create more ice and add more weight to your roof, which further threatens your rooftop’s structural capabilities. Don’t use a standard ladder if you attempt to remove snow yourself. Only special ladders – typically utilized by professionals – should be used, as regular ladders may develop ice on the rungs. This also goes for safety ropes and any other snow removal equipment. Don’t stockpile more snow onto your roof or add your own weight to the rooftop unless the action has been approved by a registered professional engineer/roofer. If you’re not a die-hard DIY homeowner or you’re not fully equipped to safely remove snow from your roof, it’s best to call a professional service like Flynn Roofing Company. We’ve offered snow removal and de-icing services for decades. It’s something we know how to do the right way, so you can enjoy the winter months without worry of damage or putting yourself at risk. Want to learn more about rooftop snow removal services and why they’re important?